Jagermeister, or Jager as we call it, and mussels are just heaven. I know you all have a bottle of Jager in your fridge. If you don’t, your going to have to pick up a small bottle to try these. I got this idea when I was searching for mussel recipes and found a copycat recipe for Carrabba’s mussels that called for a licorice flavored liqueur. I didn’t have the name brand it called for, but I did remember, I do have a licorice flavored liqueur, Jager. We had it left over in the back of the fridge from several years ago. I don’t know what the deal is with college guys and Jager shots, and Jager bombs. I was never in to it, but of course my husband was. It’s a little strong for me. I find it much better now for cooking. Jager is not only licorice flavored, but also has 56 herbs, fruits, roots, and spices including citrus peel, anise, poppy seeds, saffron, ginger, juniper berries and ginseng. We had these delicious little guys with a salad and some french bread. The french bread was essential to sop up the yummy Jager butter sauce in the bottom of the bowl. Scrub mussels clean with a stiff brush and cold water. Preheat large skillet. Drizzle with olive oil. Add onions and garlic with kosher salt. Saute for 2 - 3 minutes. Add mussels and cover for about 2 minutes, just when they begin to open. Remove lid and add Jagermeister, lemon juice, and butter. Return lid for another minute. Add fresh basil and stir just until basil is wilted. Serve and enjoy. 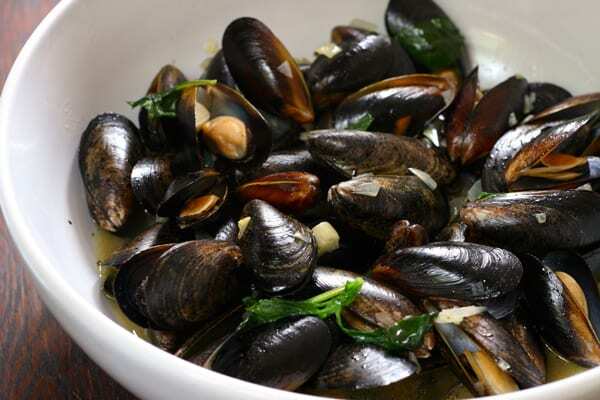 Great looking mussel recipe! Bet the Jager tasted great with them. I had to look up that song, it’s hilarious! (http://www.youtube.com/watch?v=XNtTEibFvlQ&ob=av2e) But now I have to go find out what a 3 wise men is. O.k. its Johnnie Walker, Jack Daniels and Jim Beam (equal parts) in a shot, and a four horseman is the addition of Jose Cuervo. I have met the three wise men. The only thing they’re good for is introducing you to people you don’t remember meeting the first time. These new acquaintances usually remember you vividly. Nice twist to the beer or wine which I usually use! WOW! The last time I had Jager I woke up – well, never mind. It was a long time ago! But this is a “Jager Bomb” I can get into! What a great idea. I also love how there is no additional pork products added to your broth. Much lighter! Great stuff, Angie! Great recipe! I know I’m going to love this! Can’t wait to have some drunken mussels! Better them than me! We love mussels, but I’ve never heard of preparing them with jager. I love the thought of it, and I always trust your recommendation, so someone is going to be making a trip to the liquor store very soon. Thank you for sharing love! These mussels look fresh and delicious. Jagermeister…that sounds German to me. Wow! My kids love mussels with fennel – I bet the herbaceous Jagermeister puts them on another level! Great photos! Wow, I would have never thought to combine these two ingredients, but now that you’ve done so, I can imagine how wonderful they are! That recipe looks LUSH.. I’m gonna try that today (although mussels a bit expensive right now)..